'Look What You Gain When You Travel by Train', BR poster, 1977. 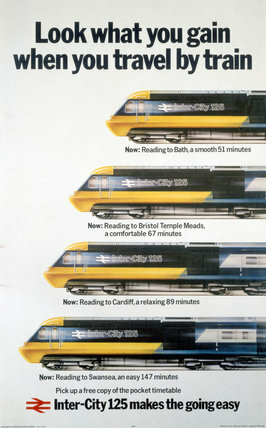 Poster produced by British Railways (BR) to promote Inter-City services from Reading to Bath, Bristol Temple Meads, Cardiff and Swansea. Artwork by an unknown artist.